Sydney Bryant was born circa 1903 at Florida. He was the son of Benjamin James Bryant and Malissa Haddock. 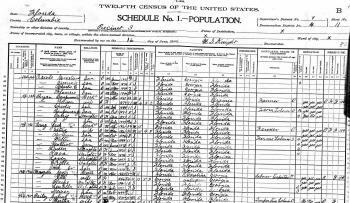 [S244] U.S. Federal Census 1910 U.S. Federal Census, by Ancestry.com, Year: 1910; Census Place: Suwanee Shoals, Columbia, Florida; Roll: T624_158; Page: 4A; Enumeration District: 0041; FHL microfilm: 1374171. [S373] U.S. Federal Census 1940 U.S. Federal Census, by Ancestry.com, Year: 1940; Census Place: Columbia, Florida; Roll: T627_579; Page: 7A; Enumeration District: 12-3. Herbert Bryant was born circa 1905 at Florida. Jessie Bryant was born circa 1907 at Florida. She was the daughter of Benjamin James Bryant and Malissa Haddock. Benjamin Bryant was born circa January 1910 at Florida. Married Name before 1888 As of before 1888,her married name was Bryant. Unknown (?) married Benjamin James Bryant, son of Samuel P. Bryant and Frances Ashley, before 1888. Unknown (?) died before 1896. Charlie Bryant was born in September 1888 at Florida. He was the son of Benjamin James Bryant and unknown (?). [S245] U.S. Federal Census 1900 U.S. Federal Census, by Ancestry.com, Year: 1900; Census Place: Precinct 3, Columbia, Florida; Roll: 166; Page: 11B; Enumeration District: 0004; FHL microfilm: 1240166. Benjamin Bryant Jr. was born in October 1891 at Florida. Samuel Bryant married Satyre (?). Samuel Bryant died before 1870 not included with Tysee in 1870 census. Name Variation Satyre (?) was also known as Tysee (?). Married Name Her married name was Bryant. Name Variation Satyre (?) was also known as Satie (?). Satyre (?) married Samuel Bryant. Satyre (?) was born circa 1822 at Florida. She died after June 1870. [S247] U.S. Federal Census 1870 U.S. Federal Census, by Ancestry.com, Year: 1870; Census Place: Columbia, Florida; Roll: M593_128; Page: 351A; Image: 709; Family History Library Film: 545627. Name Variation Abraham Bryant was also known as Able. Name Variation Abraham Bryant was also known as Abe. Abraham Bryant was born in August 1842 at Florida. He was the son of Samuel Bryant and Satyre (?). Abraham Bryant married Elsie White, daughter of Noble White and Lina (? ), circa 1871. Abraham Bryant died before 1920. [S246] U.S. Federal Census 1880 U.S. Federal Census, by Ancestry.com, Year: 1880; Census Place: Precinct 1, 2, and 3, Columbia, Florida; Roll: 126; Family History Film: 1254126; Page: 352C; Enumeration District: 019; Image: 0294. 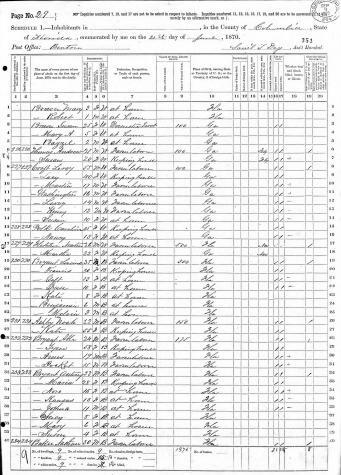 [S244] U.S. Federal Census 1910 U.S. Federal Census, by Ancestry.com, Year: 1910; Census Place: Daytona, Volusia, Florida; Roll: T624_168; Page: 18A; Enumeration District: 0163; FHL microfilm: 1374181. Amos Bryant was born in 1852 at Florida. Amos Bryant married Nellie White, daughter of Noble White and Lina (? ), before 1874. 30 June 1885 Precinct 3, Columbia, Florida He appeared on the census of 30 June 1885 at Precinct 3, Columbia, Florida. Name Variation Docket Bryant was also known as Dock. Docket Bryant was born circa 1855 at Florida. Docket Bryant died in 1919 at Columbia, Florida. Anthony Bryant was born circa 1837 at Florida. Anthony Bryant married Maria (?) before 1855. Married Name before 1855 As of before 1855,her married name was Bryant. Maria (?) was born circa 1842 at Florida. She married Anthony Bryant, son of Samuel Bryant and Satyre (? ), before 1855. Nora Bryant was born circa 1855 at Florida. She was the daughter of Anthony Bryant and Maria (?). Kansas Bryant was born circa 1857 at Florida. Joshua Bryant was born circa 1859 at Florida. He was the son of Anthony Bryant and Maria (?). Lucy Bryant was born circa 1862 at Florida. Mary Bryant was born circa 1864 at Florida. Susan Bryant was born circa 1866 at Florida. Name Variation Josh H. Lang was also known as Joshua. Name Variation Josh H. Lang was also known as J. H.
Name Variation Josh H. Lang was also known as Josh. Josh H. Lang was born in April 1861 at Florida. He married Satira Bryant, daughter of Samuel P. Bryant and Frances Ashley, circa 1885. Josh H. Lang died in 1934 at Columbia, Florida. [S244] U.S. Federal Census 1910 U.S. Federal Census, by Ancestry.com, Year: 1910; Census Place: Suwanee Shoals, Columbia, Florida; Roll: T624_158; Page: 10B; Enumeration District: 0041; FHL microfilm: 1374171. [S243] U.S. Federal Census 1920 U.S. Federal Census, by Ancestry.com, Year: 1920; Census Place: Suwanee Shoals, Columbia, Florida; Roll: T625_216; Page: 6B; Enumeration District: 51; Image: 758. [S250] U.S. Federal Census 1930 U.S. Federal Census, by Ancestry.com, Year: 1930; Census Place: Suwanee Shoals, Columbia, Florida; Roll: 308; Page: 1A; Enumeration District: 0003; Image: 660.0; FHL microfilm: 2340043. Arthur Lang was born in October 1886 at Florida. He was the son of Josh H. Lang and Satira Bryant. Walter Lang was born in November 1888 at Florida. Name Variation VanEliot Lang was also known as Van L.
Name Variation VanEliot Lang was also known as Van E.
VanEliot Lang was born in June 1892 at Florida. VanEliot Lang married Eva (?) circa 1928. Queen E. Lang married (?) Johnson. Queen E. Lang was born on 12 June 1893 at Lake City, Columbia, Florida. She was the daughter of Josh H. Lang and Satira Bryant. Name Variation Reva Lee Lang was also known as Reeba. Name Variation Reva Lee Lang was also known as Reeva. Name Variation Reva Lee Lang was also known as Reava. Reva Lee Lang was born on 14 December 1896 at Lake City, Columbia, Florida, also reported as Dec 1894. Name Variation Lovey Lang was also known as Lona. Lovey Lang was born in November 1897 at Florida. Ezella Lang was born in March 1898 at Florida. Josh Lang Jr. was born in March 1900 at Florida. Josh Lang Jr. died before 1910. Clayton Lang was born circa 1902 at Florida.